In life we meet some extraordinary people. But sometimes when we're in their presence we just don't know how extraordinary they are yet. I had the privilege of meeting one of those people. I remember the first time I met this young man. I became friends with his mother, who too is extraordinary in SO many ways. Janet and I met for a coffee at Starbucks and her son Richard tagged along. Janet says, "Richard, meet my friend Christina." He looked up with his iPod in hand, took his ear buds out and looked me right in the eye. I remember these HUGE brown eyes. And with the kindest gesture he said, "Hi, nice to meet you." and then he reached out his hand to shake mine. His mom lovingly looked on with a look only a mother can have. 1.) She was shocked at his polite manners and 2.) Gave him a grin knowing she has an extraordinary son. From that first meeting I somehow knew this boy was someone special. Although his mother reminded me of his bratty behaviour, she knew EVERYONE loved him and that his "cuteness" would always get him out of trouble. So when you lose someone like this it's so hard to fathom. 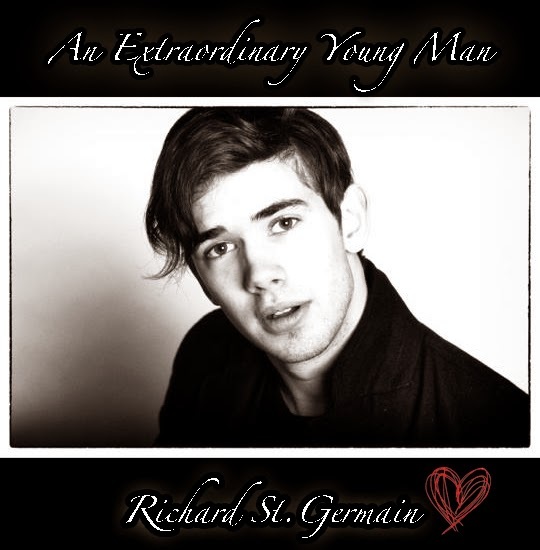 Richard St. Germain had such a gentle soul but an adventurous heart. And oh so handsome. Handsome just doesn't do this boy justice. He was so much more than a pretty face. He was a free spirited, creative, gifted and loving young man. You could tell that adventure excited him. Certainly living life to the fullest but making sure everyone else was also included. The Brighter Side is all about Good News, Great Ideas and Amazing People. So this is our introduction to one amazing man who's life was cut too short. Waaaayyy too short. And through our healing we need to remember this gentle soul ALWAYS brought a smile to our faces. His parents, Janet and Laval and his sister Andrea and brother Eric will have Richards enormous heart forever in their thoughts. And my request to you is, when you meet extraordinary people let them know how much they mean to you. If only a small gesture of saying "thanks." Richard I thank you for energy. For your talent. And most of all, in your pesky way, for loving your mom, dad, sister and brother with every ounce of your heart. Laval and Janet St. Germain wish to announce the creation of a memorial fund in memory of their son Richard who passed away on July 15, 2014 in a canoeing accident on the MacKenzie River at Norman Wells. 3. Sending a cheque or money order in c/o Margaret Mackay (via Company comat to YYCOO5T or mail to 200, 580 Palmer Road NE, Calgary, AB, T2E 7R3). Do not send cash by comat or mail.